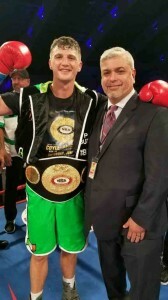 ST. PETERSBURG — Combat came to the Coliseum June 16 as Fire Fist Boxing Promotions hosted “Straight to the Money,” a night of eight bouts highlighted by a championship match up between Conner “The Kid” Coyle and Danny “El Bebo” Pastrana for the NBA Intercontinental Middleweight title. 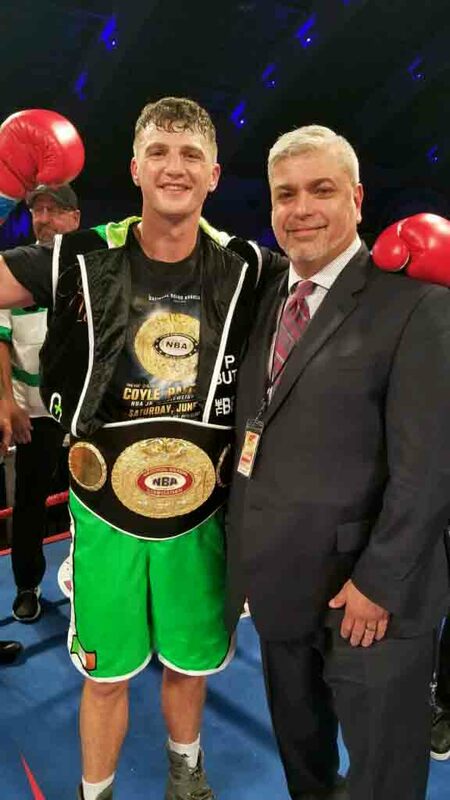 In about scheduled for eight rounds, Coyle (8-0, 6 KO) dispatched Orlando’s Danny Pastrana with a TKO at 2: 50 into the sixth to nab the middleweight belt and remain undefeated. Coyle, who hails from Derry, Ireland, but fights out of St. Pete, played it close to the vest in the early rounds, as he stalked Pastrana (6-5, 1 KO) cautiously. Though both fighters got their digs in during the opening round, it was in the second that the tentative Coyle started taking the fight to Pastrana, rocking him with a hard combination to the head and body. Pastrana did his nimble best to slip Coyle’s punches and finished strong in connecting with a few of his own right hands at the end of the round, but his inability to defend against Coyle’s assault was already apparent. The third round found both fighters in a holding pattern as they seemed content to coast after the energetic second round, but in the fourth Coyle showed what an unbeaten champ looks like as he picked his spots, systematically landing blows on the head and body of the Floridian with razor precision. In the fifth, Coyle picked up where he left off and pummeled Pastrana into a corner where he connected with a powerful overhand right. And as the elusive Pastrana escaped, Coyle later corralled him in the corner again to rain down more shots and finished the round strong. Following a series of jabs by Coyle to get in close, Pastrana showed life in the sixth as he answered with a huge uppercut, but later in the round, Coyle dealt the blow he seemed to have been keeping in his pocket all night. He detonated an explosive combination ending with a crushing right hand to the head of Pastrana, decking “El Bebo.” Though the determined but dazed Pastrana managed to get to his feet before the 10 count, referee Telis Assimenios had seen enough and waved the fight off with ten seconds to go in the round. 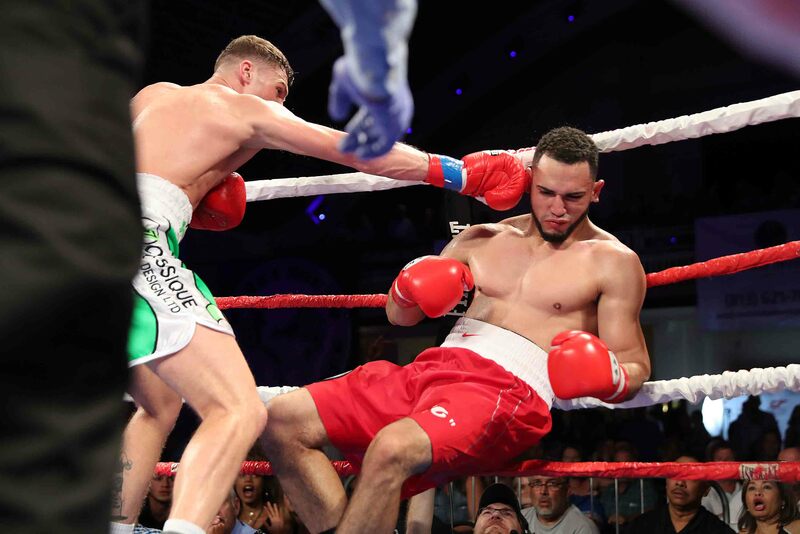 In the night’s co-main event, cruiserweight Ivan Dychko (6-0, 6 KO) of Rudny, Kazakhstan, needed only one round to destroy a clearly overmatched Michael Marrone (21-9, 15, KO) of Vero Beach, Fla. The lumbering Marrone looked awkward from the opening bell–in one of his only attempts to legitimately land a punch he lunged, missed and hit the canvas. The poised Dychko landed blows at will, knocking down Marrone twice before the fight was mercifully stopped at 2:19. Dychko remained undefeated with the win, leaving his string of consecutive KOs intact. 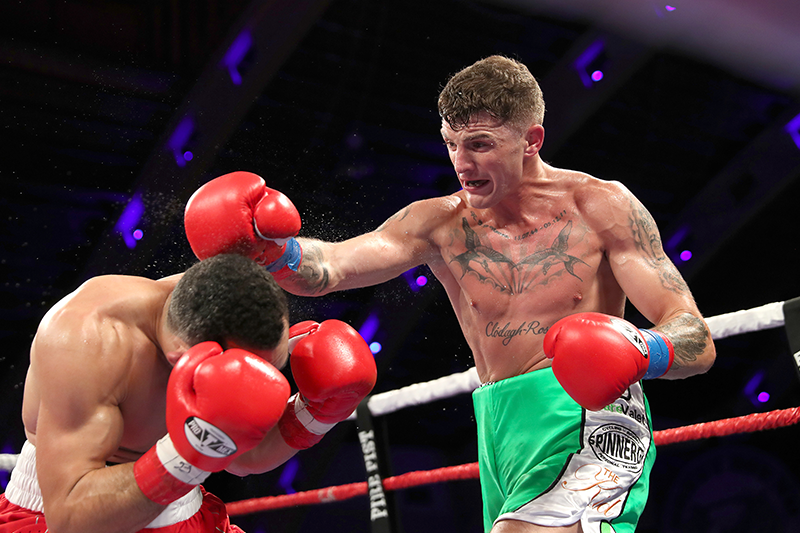 In the undercard action, featherweight Vincent Jennings (6-5, 4 KO) of Grand Rapids, Mich., scored a majority decision over St. Pete’s Jose Resendiz (5-2, 3 KO). It was an action-packed fight with both fighters gamely trading blows, and though a persevering Jennings spent much of the bout doggedly fighting his way out of a corner, he notched the win. Welters Mark Reyes (7-0, 5 KO) of Tampa and Javier Garcia (8-17, 3 KO) of Gurabo, Puerto Rico, faced off in a contest scheduled for six but went only one as Reyes took it to the outclassed Garcia and bashed his way to a TKO at 2:25. After connecting with a thunderous left hand, Reyes doubled up with a fierce left hook that rocked Garcia. After a wicked right shook Garcia–a shot from which he never truly recovered–a stream of blood made its way down from Garcia’s forehead as he tried to hold on and absorb a firestorm of blows from a tenacious Reyes before the carnage was stopped. Reyes kept his record perfect with the win. In other undercard bouts, journeyman junior middleweight and local boy Ali Tareh (13-14, 6 KO) of St. Pete dropped a heartbreaker to Lionel Jimenez (5-23-1, 4 KO) of Eagle Pass, Texas, as Jimenez squeezed out a close split decision. Heavyweight Rodriguez Cade (2-1, 2 KO) of Monroe, Ga., scored a second round KO over Gary Kelly (1-7, 1 KO) of Tallahassee. Joseph Fernandez (8-3, 1 KO) of Arcadia took a win by decision over Larry Yanez (4-10-2) in super lightweight match up. And, bantamweight Brian Cannady (3-0, 3 KO) of Ft. Myers kept his record spotless by spoiling the pro debut of Michael Wooten (0-1) of Chattanooga, Tenn., as he won with a fourth-round TKO. The next fight night at the Coliseum is scheduled for Oct. 6.